2013 December | whydocatholicsdothat.com Blog– Pray. God is waiting. God is your beatitude. The things of time are toys. You are eternity’s child and your eternity has already begun! There is a compelling urgency to every day and every hour of the day. In it we are to witness to the truth — that God greeted and gifted us at Christmas. 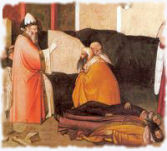 Blessed Vincenzo David Vilar, secular, during religious persecution housed the priests and religious in his home , and preferred to die rather than renounce the faith of Christ. John Paul II beatified him on October 1, 1995. Roman Martyrology: At Valencia in Spain, blessed Vilar David Vincent, martyr, during the persecution of religion in his house welcomed the priests and religious and preferred to die rather than renounce his faith. Even businessmen go to heaven. Especially if the conduct of their business and relationship with the workers manages to embody the social doctrine of the Church; they know and put in first place solidarity, justice and cooperation. 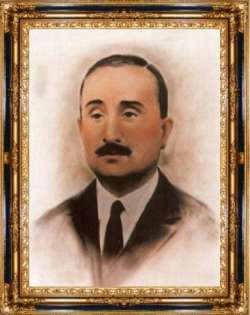 A businessman came to the glory of the altars on October 1, 1995 is Vincenzo David Vilar. Born June 28, 1889 in Spain, in the province of Valencia, the last of eight children of a deeply Christian family, owner of a ceramics factory that has now acquired international fame. Cheerful, outgoing, with a strong faith that is reflected in concrete works of charity, Vincent graduated in Industrial Engineering and after the premature death of his parents, along with three of his brothers in the conduct of the family and now stands out for the way in which the original heads. In this factory, relations were guided by a sense of justice and solidarity that can overcome conflict and division. Employees were treated as true friends, helping them when possible andandoli to find when they were sick. After all, Vincent was not that other sow love at work as always is doing in the group of his friends and among the poor of the parish. What was going against it demonstrates the disputes and difficulties he would meet on his path, but could not back off one inch from his convictions and his commitment remained firm and clear, despite all the measures to taken for his workers In his commitment to the parish catechesis of young people in the various clubs and associations he directed. He did not pull back even before the administrative obligations that were proposed for seven years and was vice president of the Municipal Corporation of the city, leaving the example of a person of integrity who seeks the true good of his people. For 33 years he was married to Isabella Rodes Reig, a woman who shared his ideals and his commitment and from that moment became the most valuable collaborator of his activities in the parish and his works of charity. On a cultural level he was involved in the foundation of the “Patronato Parish Social Action for Catholic education of children is the way to challenge and counter the anti-action that the early thirties to the Spanish Government was implementing. At the outbreak of the revolution of 1936 anti-Vincent was a person too with a view and too involved to go unnoticed. And he was too bold. He became the shadow of his pastor, to help and defend him until they will be murdered, in his house were welcomed priests and religious seeking to save their lives, continuing undeterred in his actions as ever despite the threats and the more or less explicit warnings. It was inevitable, therefore, that this very committed Christian and inconvenient man would be arrested. Before the Court, where he could deny his religious beliefs to save lives, he showed everything in one piece, happy and peaceful for how he lived so far and what has worked. He forgave his persecutors just a few moments before they shot him, February 14, 1937. His employees closed the factory for three days as a sign of mourning and resisted all pressures of the authorities who wanted an immediate re-opening, because, they said, Vincent was not only a manager but a father to each of them. His beatification has raised a holy impresario, who probably would have earned the glory of the altars without martyrdom, however, that was the culmination of a life steeped in all justice, charity and faith courageously lived.